A view of the Kulathupuzha river on the Trivandrum – Thenmala route. 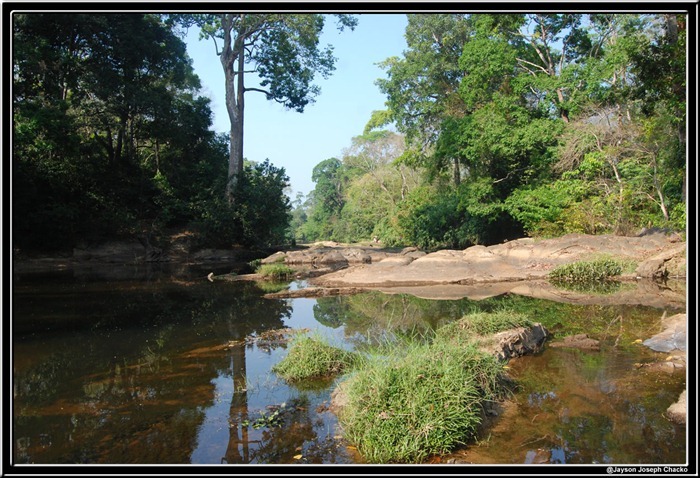 Kulathupuzha is a tributary of Kallada river, one of the 44 main rivers in Kerala. The photo below is taken in Kollam district and was shot during summer when water level is at its lowest. I was driving from Trivandrum city to Thenmala and at about 50KM from Trivandrum city, I noticed this river on the right side. We were looking for a place to have our packed breakfast and what better way than to have it on the river side! This is a forest area and the other side of the river seems to be thick forest. Also beware of snakes, I had a close encounter with one while getting back to the car. This also seems to be a paradise of birds. I intend to return here sometime in future for bird watching. Hi friend, I was looking for some info on the Trivandrum-Thenmala-Shencottah route (particularly the quality of the road) as Iam planning to drive to Kodaikanal this weekend. If I might ask you, can you let me know if the road is in good condition? Or should I take the nagercoil route instead? Only constraint for me is, that I need to reach Kodai latest by 11pm. I can leave TVM by 2 pm. Thanks for the help. Try the national highway. You would get four line express way after Nagarciol. Can really enjoy the drive. But for scenic drive, take the Shencottah way.